LIGHT WEIGHT TRUCK CAMPERS, TRAVEL TRAILERS, TOY HAULERS, FIFTH WHEELS, PARK MODELS, DESTINATION TRAILERS, LANDSCAPE, UTILITY, CARGO TRAILERS, CAR HAULERS, AMERICAN MADE STEEL CARPORTS, AMISH BUILT CUSTOM SHEDS AND OUTDOOR STRUCTURES. Hey, our business is growing and we are hiring! If you or someone you know wants to be a part of an awesome team check out our job listings on Indeed.com. East Coast Campers and More is located in Frankford, Delaware on the corner of Rt. 113 and Parker Road. 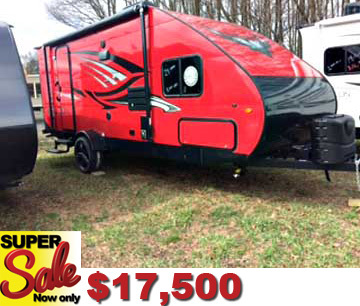 We have a great selection of new and used campers and RV’s, sheds, carports, utility trailers and more. We are a family owned and operated business and can offer you an exceptional RV buying experience with excellent customer service. 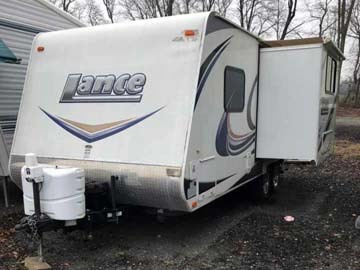 We provide the highest quality RV services and repairs, and the largest selection of parts on the Eastern Shore at our Service Center in Frankford, DE. Our Mobile RV Medics can also provide service at your location in Delaware, Maryland, and Virginia (within 60 miles of our service center). Contact us at 302-927-0541 to schedule your service now. 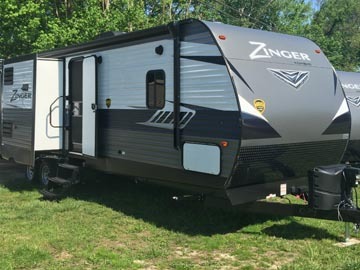 The Crossroads RV Zinger travel trailer offers an abundance of great features. 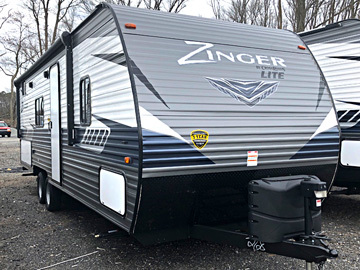 Just a few of the features that make the Zinger stand apart include a heated and enclosed underbelly, black tank flush and lumber core screwed and glued cabinets. Come in and discover the Zinger for yourself today! 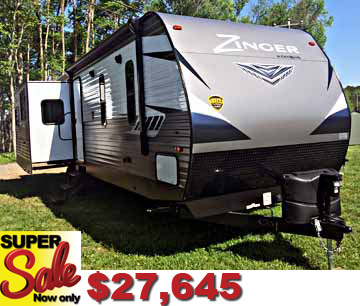 This 2019 258BH Zinger is great for families with kids! 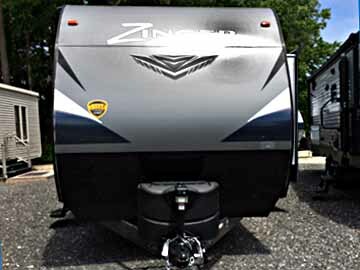 Has all the outstanding features the Crossroads RV Zinger is known for. This one has two bunk beds and an outside “country girl” kitchen! This is a great travel trailer for families with children! Features 1 1/2 baths and the kids’ room includes bunks, a tv console, and lots of storage space! The back door provides easy outside access to the 1/2 bath in the kids’ room. Exterior features include a totally enclosed heated underbelly with forced heat and an outside kitchen. Inside you will love the wood grain vinyl flooring and a great kitchen island with a 60/40 sink! 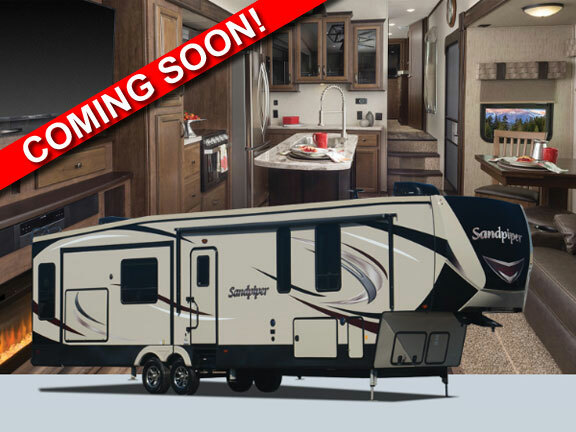 Come in and check out the new 2019 models from Crossroads RV! 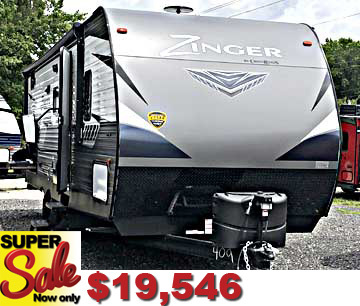 This 2019 328SB Zinger is a great option for families with kids! Features a great bunk room with an entertainment center. It sleeps 11 and has all the bells & whistles. Has an electric fireplace and an outside “country girl” kitchen! One of our first 2019 models was just delivered! This model features two slide outs, one and a half baths, and a bunk room that is perfect for families with kids. There are two entrances to the main bathroom, one for easy access from the master bedroom, and one from the living room. And you will love the kitchen island with a 60/40 sink. 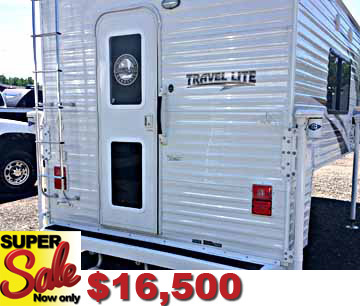 NOW OFFERING NEW PRICING ON ALL TRAVEL LITE TRAVEL TRAILERS! Discover the advantages of owning one of these amazing travel trailers! Travel Lite blends style, functionality, and comfort… all while being the easiest and safest towing trailer in the market. Cutting edge modern design and technology with ALL the function you deserve in a travel trailer. 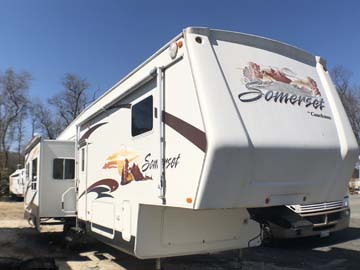 Features a non-slide, wet bath trailer with a queen size bed, solid surface countertops, tempered glass cabinetry, and much more. Check out the 3D virtual tours! 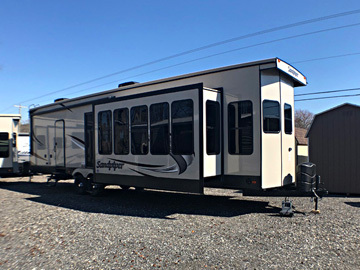 Our first NEW 2019 Travel Lite 14 ft. Travel Trailer has arrived! 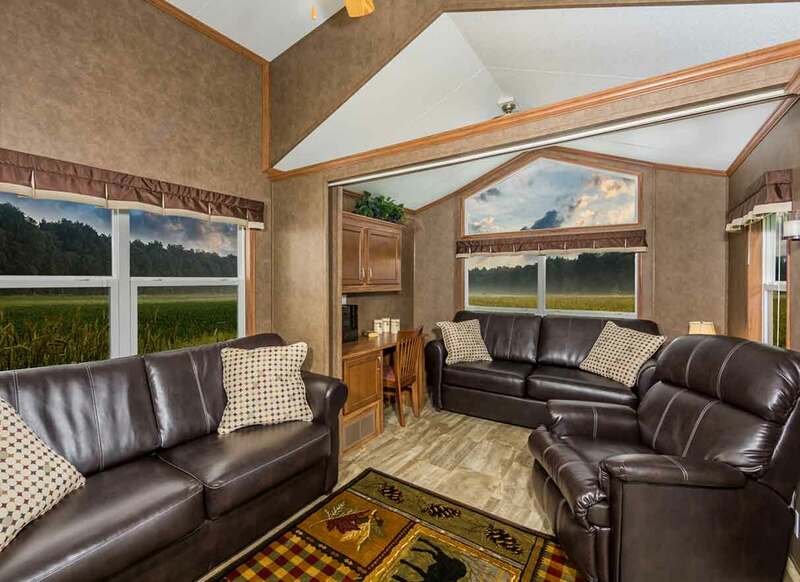 The F-Lite’s three-floor plans are offered in 14-foot, 18-foot, and 19-foot models. Starting at 1,692 pounds, this can be towed by most small vehicles out there! 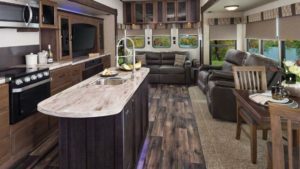 The 14-foot model has a dinette that converts to a bed, a bathroom with a shower and toilet, two pantry/drawer spaces, along with overhead cabinet space and a deluxe wardrobe. On the exterior, the floorplan features three slider windows and a large pass-thru storage compartment. 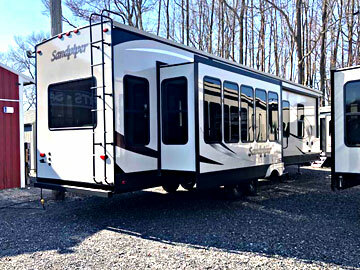 One of our first NEW 2019 Travel Lite Travel Trailers has arrived! This is a 3500# axle with 15″ aluminum rims. Has a 20 lb. propane tank and tinted radius slider windows with screens. Features a stereo with indoor/outdoor speakers and an outside shower station. 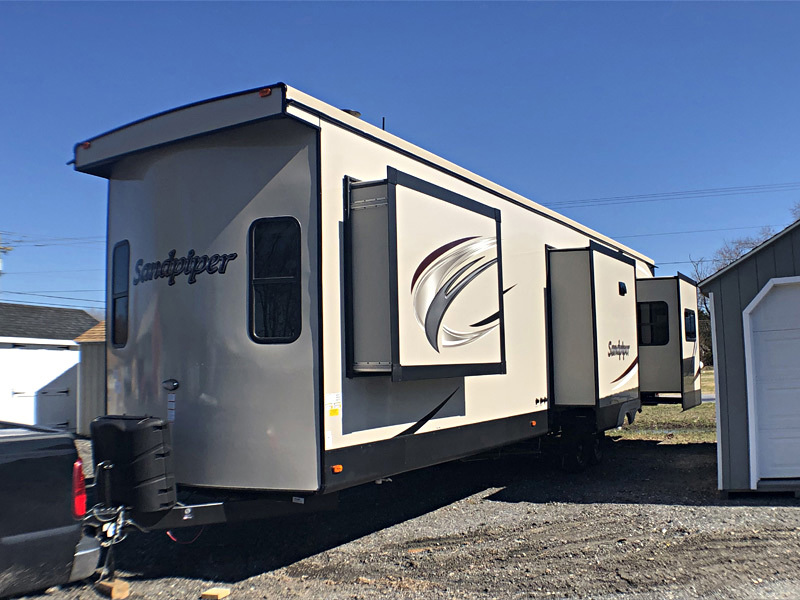 One of our first NEW 2019 Travel Lite Travel Trailers has arrived! 2,480 lbs. dry weight with standard equipment. Dry tongue weight is 260 lbs. Length is 19’10” with an interior height of 75″. Carries two 20 propane tanks and has a 5 cubic foot refrigerator. 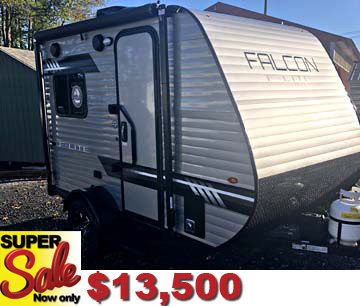 Turn up the heat in this Travel Lite Falcon Fire Ultralight trailer with a 24 ft. bunk house. 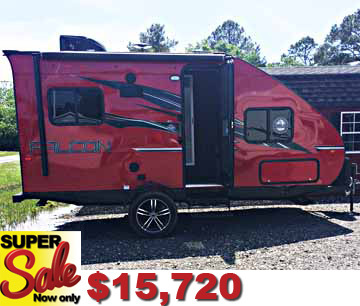 Features red aluminum exterior that sleeps 6 with one slide-out, smart jace, 18″ rims, LED lights, Bluetooth/USB sound system with interior/exterior speakers. This eye-turner has all the bells and whistles! Dry weight is 3,215. 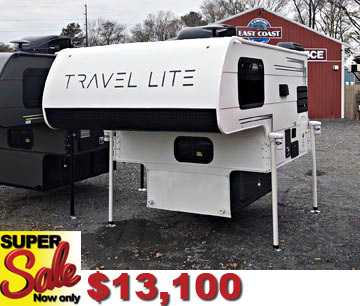 Check out the extreme sports option package on this beautiful white toy hauler! A bike rack and roof rack with ladder, blacked out wheel package and an 80-watt portable solar panel! Includes electronic tongue jack with battery, 32″ TV with indoor/outdoor brackets, Kicker entertainment center with indoor/outdoor speakers. Fantastic vent in the bathroom. 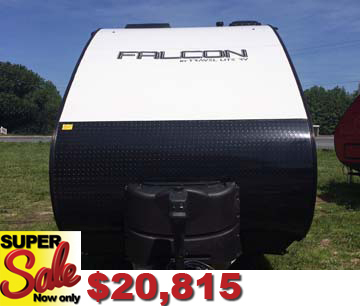 Heated hold tank pads and added thermal foil insulation make this a perfect three season camping recreational dream. NOW OFFERING NEW PRICING ON ALL TRAVEL LITE TRUCK CAMPERS! Travel Lite RV is the King of 1/2 ton compatible truck campers – PERIOD! 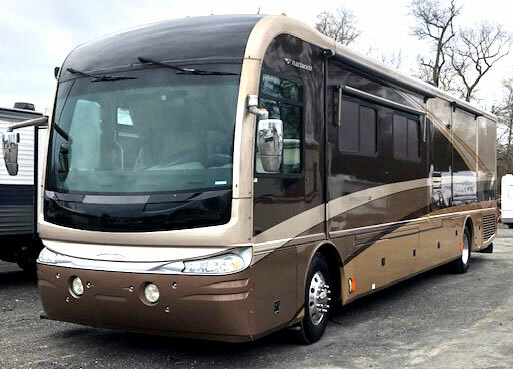 There is no other RV Manufacturer in the market like Travel Lite RV! Come in and take a look today! This Travel Lite 800X is a real beauty at a great price. All the usual interior and exterior features Travel Lite is famous for. 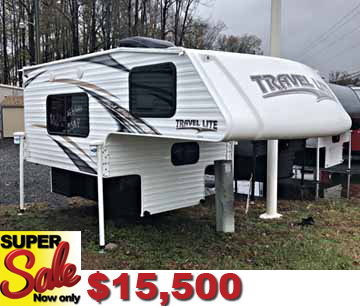 This features a water heater, outside shower station, AM/FM/USB/Aux with indoor and outdoor speakers, a wireless remote electric jack with battery, and a 5 1/2″ rear awning. This new Travel Lite 840SBRX is a truck camper for short bed trucks. The base weight is 1,965. 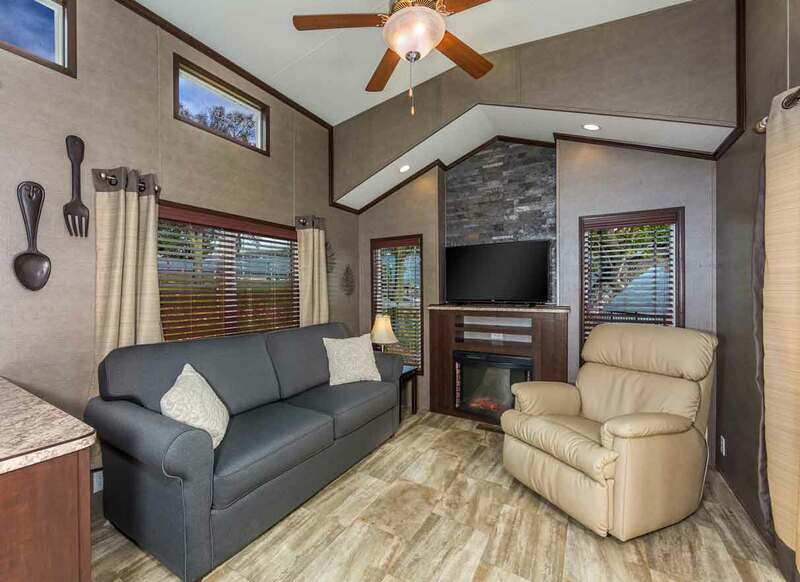 All the usual interior and exterior features Travel Lite is famous for including the LED interior light package, and the solid wood construction, 3 1/2″ wood bow truss rafters, R7 insulated walls, and a double plywood insulated floor system. Customize your vacation home with the selections of your choice! Choose from two series with a variety of floor plans. 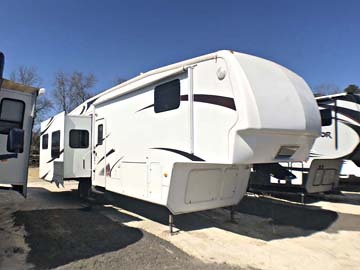 A park model is an RV that is primarily designed as a seasonal camping solution. Often used as a vacation home, they are built on a single chassis, mounted on wheels, and cannot exceed 400 square feet. They are spacious and have all the comforts of home including thermo pane windows, microwave ovens, or fireplaces, and hardwood cabinets. Many floor plans also include a loft area. The Bayview offers three floor plans available without lofts, and three available with lofts. Standard width is 12′ wide and lengths range from 35 ft. long up to 36 ft. 9 inches long. The Parkvue offers four floor plans without lofts, 13 floor plans with lofts, and two floor plans with triple lofts. Many features and custom options available. Standard width is 12 ft. wide and lengths range from 30 ft. long up to 37 ft. long. We are excited to announce the delivery of our first Forest River Sandpiper Destination trailers. More models will be arriving! Pre-orders and custom orders are available. The 401FLX is the ultimate “open concept” floor plan. It offers opposing slide outs in the living area that creates a great floor space for relaxing. It also offers ample pantry space, washer/dryer prep and has a great island kitchen. This is our first delivery of these luxury destination trailers! 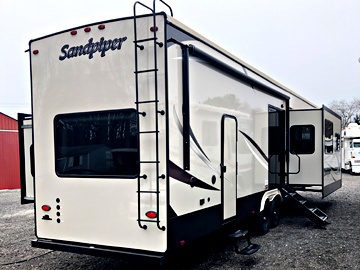 The 399LOFT is one of Sandpiper’s amazing creations for family camping. The loft unit provides a private upstairs room for the children, totally tucked away and private. The best thing, though, is that this floor plan still offers an amazing kitchen and living room at the same time. This unit far outshines your standard bunkhouse layout. Weighs 3,650lbs. 23.33 ft long. 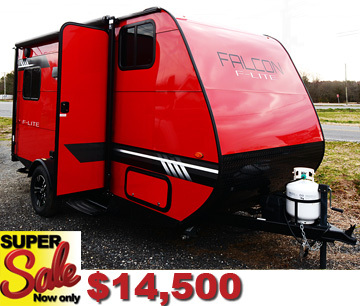 This self contained 2-axle fifth-wheel features 3 slide outs and weighs in at only 10,150 lbs. The size is 37′ x 8’3″. Features beautiful spicy oak cabinetry and hardwood raised panel cabinet doors with a large double door refrigerator. Designer window treatments. Nice large bathroom with flush floor transition from bedroom. In excellent condition! 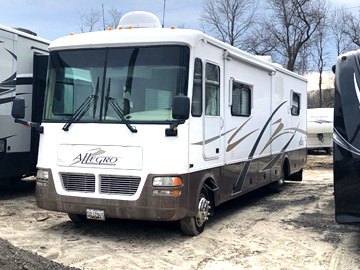 This class A motor home is in excellent condition with only 71,180.5 miles. Two new Sumatomo front tires ($700.00) were just added in July 2018. Two new 12-volt batteries ($200.00) were added in October 2018. Other new additions include a new large slide motor ($750.00), new bedroom TV ($200.00), Onan generator with 585 hours, oil change with filter was just done, a Michelin spare tire was added. The satellite does not work and is disconnected. 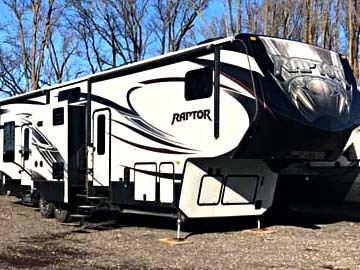 This amazing 2014 KEYSTONE RAPTOR 332TS FIFTH WHEEL TOY HAULER has a garage area that has a Dometic pull down screen and pull down deck area. It also includes an electric double bed/dinette and bunk that raises when using as toy hauler. It is in great shape and fully equipped. Features lots of outside storage area, electric awnings, and it is washer/dryer ready! OUR MISSION IS TO PROVIDE EXCEPTIONAL CUSTOMER SERVICE BEFORE, DURING AND AFTER THE SALE. YOUR COMPLETE SATISFACTION IS OUR GOAL IN CREATING A LASTING RELATIONSHIP. WE THANK YOU AND APPRECIATE YOU PUTTING YOUR TRUST IN US. ONCE YOU EXPERIENCE OUR FAMILY OWNED AND OPERATED CULTURE YOU WILL BE A CUSTOMER FOR LIFE.